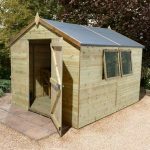 At 6 X 10 the Hartwood 6′ x 10′ Double Door Overlap Apex Workshop is one of the largest products in our discount sheds section. This really is one very large shed that is going to give you a lot of room to make use of. While there is a generous amount of floor space, along the ridge, you also have 7 feet of headroom, so pottering around in here will be very comfortable. A set of large z braced double doors make getting even your largest items in and out easy. Plus those four large windows will ensure that there is plenty of natural light getting into the shed and they also give the structure a lot of personality. Thanks to the overlap cladding that has been used, this is a shed which has a very classic and rustic kind of design. This cladding is backed up by an impressive, 28 mm x 28 mm frame which keeps the walls very strong. Those four windows are made from shatterproof polycarbonate so there is no worries about broken glass. The roof and the floor are made with the same kind of boarding which is very practical and also helps this be sold at such an affordable price. The Hartwood 6′ x 10′ Double Door Overlap Apex Workshop did used to be referred to as a shed, but it for some reason has been changed to a workshop. 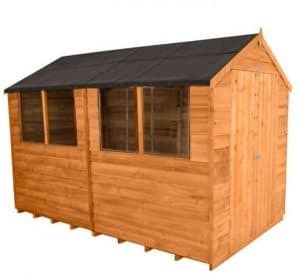 Anyway we know the price may seem a little high considering this is in our discount sheds section, but actually for under £400 you are getting a lot of shed here. 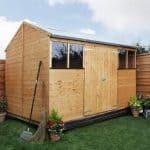 The width is 6 feet 3 inches and the depth is an incredible 10 feet 3 inches so for those looking for a lot of space, but for not a lot of money, then this shed is one to think about. It was not just the floor space that impressed us, as the ridge stands at just over 7 feet high and even the eaves at 5 feet 4 inches is not too bad. In all there is a lot of room to make use of in here. You can have shelving, work benches or just one huge space to store a whole lot of junk. No matter what you use it for, we are sure you will be happy with the space it offers. Oriented strand board that is covered with black sand felt is what they have used for the roof. To be honest this is exactly what we expected and while it is not the most high quality roof out there, we feel it is good enough and will not cause you any problems. This is an apex roof that is designed so that the rain runs off at the sides, not at the front. If you look closely you can see there is a tiny overhang which should at least in a small way keep the rain from running down the sides of the shed. As the Hartwood 6′ x 10′ Double Door Overlap Apex Workshop is such a good size they were always going to have to cut back on somethings and we feel that the cladding is one of the areas they have cut back. Now do not get us wrong, the overlap cladding they have used does have a very rustic charm, but at 7 mm thick it is a little on the thin side. Still as long as you are not wrestling or hosting barn dances in here, we are sure you will be fine. The same kind of boarding that is used for the roof is what they have for the floor and to be honest with you, this is what we expected. While not the highest quality flooring, this oriented strand boarding can still take a lot of weight and no matter how many tools, shelves, worktops or whatever you plan on putting in here, we are sure that it is going to be able to handle it. We have seen some discount sheds that are pressure treated, but due to the size of the Hartwood 6′ x 10′ Double Door Overlap Apex Workshop we knew this one would not be. It has been dip treated, but this is only for the short term. Quite soon after installation, you will want to give it a coating of wood treatment and then a fresh coat on an annual basis after that. As long as you look after the wood by giving it an annual coating of wood treatment, then you will be covered by a ten year anti rot warranty which we feel is more than fair. The doors are one of the most impressive aspects of this shed. They are large double doors that make getting in and out very easy, even if you are carrying a whole bunch of tools or gardening equipment. At 3 feet 10 inches wide and 6 feet 9 inches high, these double doors are incredibly large and impressive. One other thing that is impressive about the doors is the way they have used z framing to make sure they are nice and strong. Add to this some hidden hinges and you can clearly see that a lot of the budget for this shed went on the doors. Along one side of the shed there are four good sized polycarbonate windows. These are all fixed and they are designed so that they will not turn yellow like some plastic shed windows have a tendency to do. With so many windows, during the day plenty of natural light is going to get inside of here. There is a hasp and staple included with the Hartwood 6′ x 10′ Double Door Overlap Apex Workshop which is fine if you do not have any expensive items inside. But if you do have a mower or say some rather expensive tools then you may want to think about adding some kind of lock. Or if you have the budget for it, an armed guard. We have seen many discount sheds that offer a lot of privacy simply because windows is one of the areas that they cut costs on. This is not the case here though as one side of the shed is very exposed. While we love the fact there are four good sized windows on here, we understand for some people this is not something they like. Just add some blinds, curtains or just a cheap bit of fabric and you will be fine. One way that you could customise the shed and also treat it at the same time is with some coloured wood treatment. We have seen wood treatment in many different colours. Long gone are the days when your choice was brown, light brown or dark brown. Now you can get red, blue, green and all kinds of colours. This is a shed that does have quite a few extras. 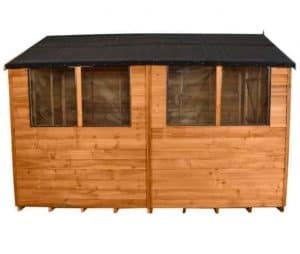 To start with they do have an installation service which is priced at £229.99 and which we feel is rather expensive as it is over half the price of the actual shed! They have various shelving options for you starting at £24.99 going up to £34.99. If you fancy adding some security then they do have a Yale branded padlock set for £19.99. You can take your security to the next level with a Shed Alarm Kit which is priced at £29.99. If you want to give the floor a little bit more support, for £149.99 you can purchase a plastic shed base. 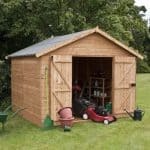 Considering the size, this is one very well made shed that even at the relatively low price they are asking has some great features. 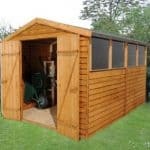 As long as you look after the shed right, we see no reason as to why you could not get many, many years of use out of it. Just remember that it is your responsibility to treat the shed and keep it free from rot. 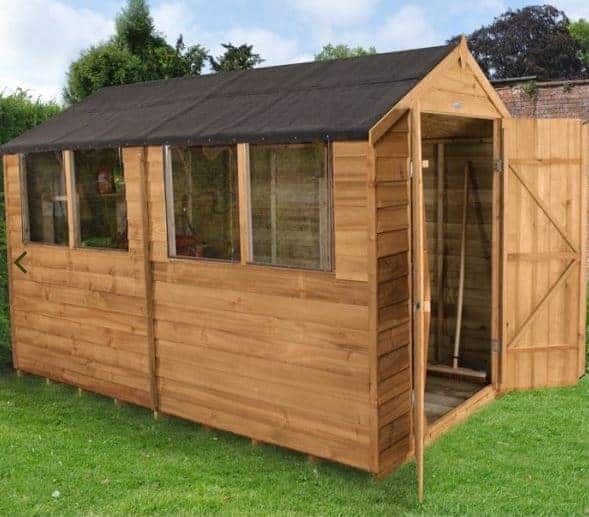 We love the size of this shed and are sure that no matter if you use it for storage or your own little DIY or craft projects, you will be very happy with the space that it provides. 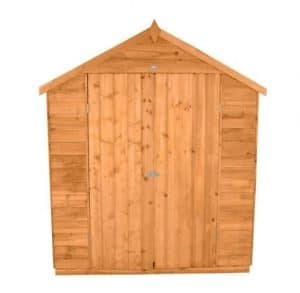 This is a rather large shed so you will need another person to help and it can be a little awkward in places. Still if you take your time, follow the instructions and have plenty cups of tea it will be a rather stress free installation. 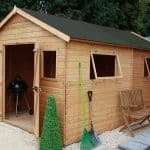 While the price is a little higher than some of the other sheds we have in this section, considering the size, we feel this is offering very good value for money. Final Thoughts: The Hartwood 6' x 10' Double Door Overlap Apex Workshop is a very impressive looking shed. 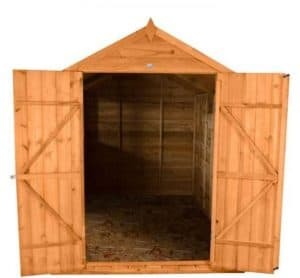 We really like how much larger it is than many of the other discount sheds we have looked at. 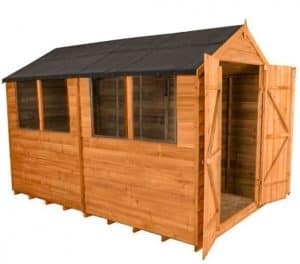 While it may not be as high quality as some of the more pricy sheds, we are sure you will be very, very happy with all the space it offers you inside it. Plus this is actually a very pleasant looking shed that has a lot of personality. We are sure you will love having this as part of your garden. Also we feel that the asking price is great for those who are on a more tighter budget or who just want to get as much space as possible for as little money as possible.